If Penske buys Saturn, could Renault-Nissan be his partner? 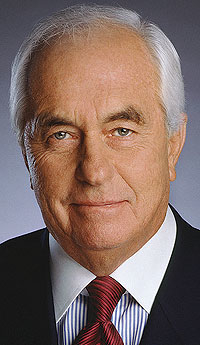 Roger Penske says hes interested in Saturn but has not made a proposal to GM. If Roger Penske acquires the Saturn brand from General Motors, where would he get his cars? The auto entrepreneur, chairman of Penske Automotive Group Inc., confirmed last week that he is interested in buying Saturn. The next day media reports named Renault-Nissan as another potential bidder. Only two bidders are on the record: Penske and investor group Telesto Ventures. But The Wall Street Journal, citing unnamed sources, said last week that Renault-Nissan was negotiating with GM to buy Saturn as a way for the French-Japanese auto group to expand its U.S. presence. Also citing sources, Bloomberg reported that Nissan could consider joining Penske in a joint operation to run Saturn. While not directly denying either report, Carlos Ghosn, CEO of Renault and Nissan, said last week he is not negotiating with GM about Saturn. Dealers have been told they can count on Saturn's current vehicle lineup through the 2012 model year. After that the new owner would have to provide vehicles to be sold under the Saturn name. GM intends to divest Saturn "as fast as possible," said Steve Girsky, the former Wall Street analyst whose S.J. Girsky & Co. is helping GM review potential buyers. He said GM is vetting the plans of a number of interested carmakers and dealer operators. He declined to comment further. In a conference call, Penske, 72, said he has not made a proposal to GM, but he confirmed that Penske Automotive is interested. Penske Automotive ranks No. 2 on Automotive News' list of the top 125 U.S. dealership groups. It owns 149 stores representing 40 franchises. It has exclusive U.S. distribution rights for Smart. In April, Telesto, based in Oklahoma City, said it wanted to acquire Saturn's retail operations and provide dealers with vehicles from GM through 2011. After that, most vehicles would come from overseas.